Maybe I needed that fast FO to kickstart my finishing urge: I finished two more projects in the last two days! Apparently, if you keep knitting on something, eventually it gets done. Crazy, right? First I finished my Gossip socks, on the needles for two months. The yarn is Hedgehog Fibres Sock and it’s so pink that I struggled to get an accurate photo, but this is pretty close. I liked knitting with this yarn; it wasn’t like alpaca-soft but it felt good in my hands, and it feels like it will hold up well. I’ll let you know! My other FO is my Standing Rock Hat, which took a month despite being just nine inches of ribbing. It was my travel project until I decided it needed to just be done. Mine didn’t look as good as a slouchy hat as the designer’s did, so I cuffed it up and like it a lot. The yarn is Primrose Yarn Co. Jasper, a DK merino. It wasn’t nearly as soft as I thought it would be, so I don’t know how it will feel against my skin for prolonged periods. I don’t normally block hats but I think I’ll unsnap the awesome removable pompom and give it a soak in some wool wash to see if it softens up. I can see the finish line on another project, so that’s my goal for this weekend. Hope you all are getting some productive knitting in too! I finished a hat this morning and it’s so pretty! This was my spur of the moment “I need to make a hat” knitting this weekend, and it fit the bill perfectly. Pattern: Fairy SnowCap It was well-written, included lots of tips and instruction and photos. Very little repetition in the lace pattern so it made me think without making my lose my head. Yarn: Classic Elite Yarns Jil Eaton Minnow Merino in dark pink. 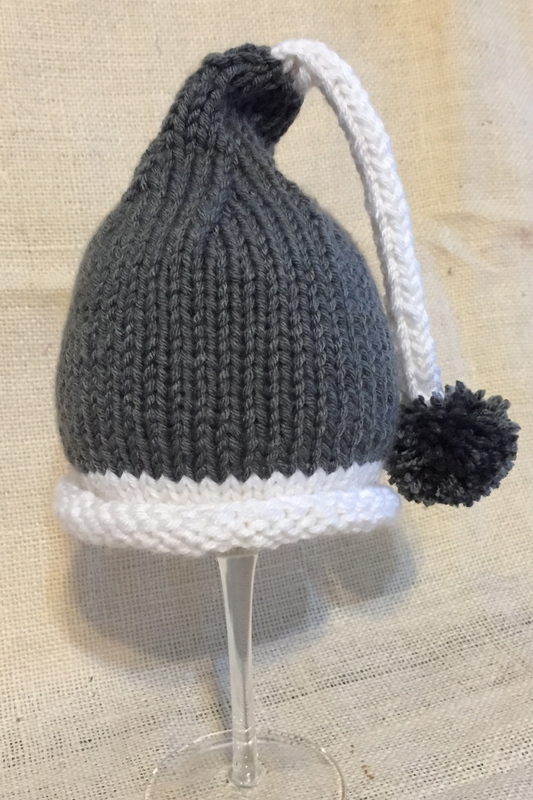 Used every bit of 154 yards, and that was making a slightly smaller pompom than the designer. Now, here’s what I didn’t like: making a hat top-down! You have to start on DPNs, which aren’t my favorite, and this pattern has a lot of YOs and my YOs never ended up at a good spot on my needles so I switched to 9″ circs as soon as I could, but they were metal Addis and way too slick for this yarn/pattern. Once I was able to get to my bamboo 16″ circs, it was okay, but then you run into the bottom edge problem: it needs to be stretchy without being too big. The pattern recommended a sewn Kitchener bindoff, and included a handy phototutorial and everything, but I’m a lazy knitter and I just did Jeny’s Surprisingly Stretchy bindoff instead. It fits my medium-size head well, maybe loose enough that it would work well on a large head too. So I’m calling this a win, but I probably wouldn’t knit this pattern again. That’s totally me and my preferences, and not the pattern. I hope you’re all enjoying your weekend as much as I am mine. (It’s wonderfully unscheduled, leaving my lots of crafty time.) I even have plans to go to a LYS today! What do you make for a Spring craft show? I love this style! I may have made the long tail a bit too long, but since this is a newborn size I’m not concerned about the baby being able to grab it or get it in his/her mouth. 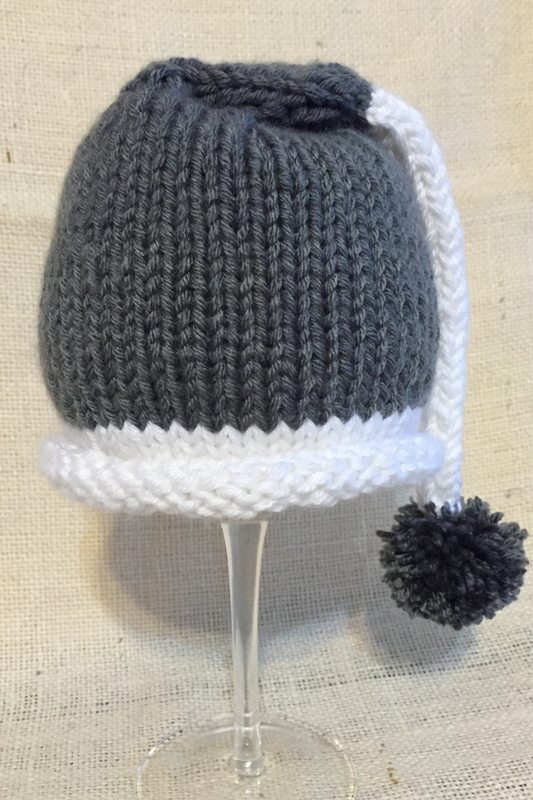 And I am loving the gray/white color combo, so cute for either a boy or a girl! See, here’s another one: This is probably a 6-9 month size. I’m so proud of how it turned out. The stitches are so neat and tight, and I wish I’d taken a picture of the join edge, because I have to say, it’s the best I’ve ever done. You can hardly tell it’s there. I carried the yarns up, twisting them around each other with each row, and it’s practically invisible! How about that?? I love it when I can see improvement in my knitting skills. This is the kind of stuff I want to make going forward, classic styles in good yarn with quality workmanship. And hats like this are a bit quicker, too, so I can build my inventory faster. 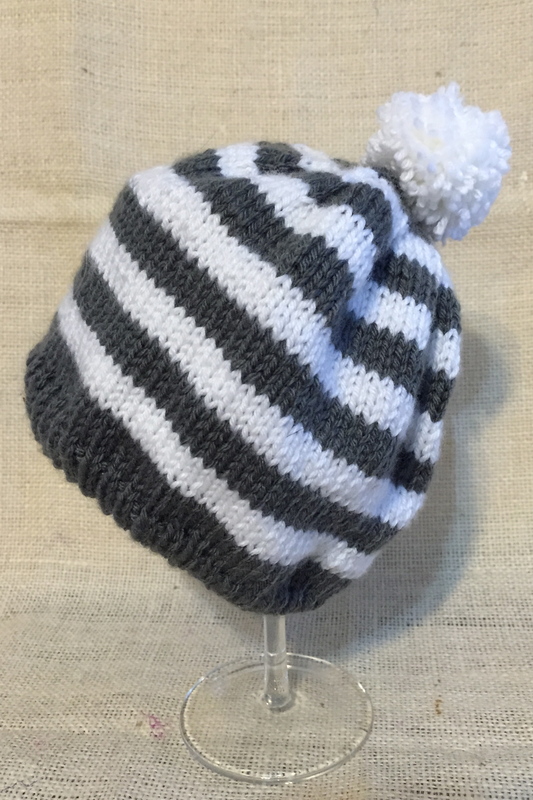 I made the striped hat yesterday, all in one day. I did have to take a break in the middle because the tip of my middle finger went numb. It does that every once in a while, and I’m sure it has something to do with the nerves going from my wrist to my fingers. I should probably wear my wrist support when I knit for a long time. I won’t need to today, though, because today I have 50 million errands to run for my daughter. Okay, only three. And one for my mother. At least my son is still low-maintenance!